All week long I have been working in Porcelain. And all week I have been questioning myself as to whats the point of the porcelain if all it does it makes things more difficult to make? I am serious when I say things have become much more difficult too. Let me explain, I want you to imagine making mud pies as a kid. Ok, the material you are using is most likely full of grass, and sticks, maybe some rocks, and of course lots of dirt and some water. You can shape your pie into a number of things and it doesn't fall apart or crumble, and if it does you can always just add more material to the mix until it gets back to its happy mud pie self. This happens to work due to all of the physical material inside of the clay...the grass, the sand, the bits and pieces of random things...it all helps hold the clay in place. Now, imagine having none of that, and instead of working with dirt, work with butter. Work with room temperature butter that does nothing but sass at you like an angry child. That is porcelain. It's watery, runny, does not have any boy to it, and shows every imperfection. Until I get a piece out of the kiln, I shall hate this material. But enough about ranting on my new found "holy clay". I want to talk about an artist who does not work in clay. Lately I have been very engrossed in ceramic artists and all that they can do but I think I need to also be looking at non-ceramic artists like Valerie Hegarty. I came across her work while looking for some new fabrics online. She makes installations out of paper and old Americana objects, transforming them into new paintings through a process she calls "reverse archeology". Her statement, which I liked so much I've posted it below talks about the importance of history and memory in her work, but at the same time the state of our country. It's a unique style that I can appreciate for it's intense process. She had a number of shows in 2015 and has been active for many years but her website does not have anything listed at all for the year 2016, so it makes me think she waits to upload until she's got a number of things to post. 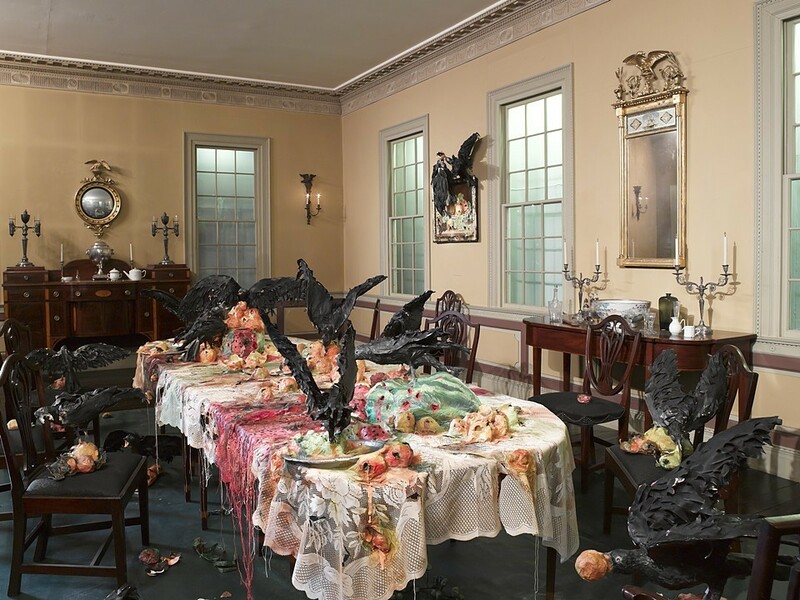 She had a few different group shows in 2015, to include Dual Nature: Selections from the Chaney Family Collection, Pearl Fincher Museum of Fine Arts in Texas; Post Human Utopia in The Lodge Gallery in New York; River Crossings at the Olana and Thomas Cole Historic Sites in New York; and Forgetting the Future: Entropy in the Reflective Age at the Torrance Art Museum in California. What I think I find so interesting about her is her use of materials in so many different ways. I enjoy her historian series which I have shown here, because of the incorporation of the entire space. Its a full installation, something I wouldn't know where to begin working with. Informed by the current turbulent state of our country while also excavating from America’s past, Valerie Hegarty often turns the gallery into a dramatic place of change. Her large-scale installation work incorporates a process she calls “reverse archeology” in which layers of painted paper are adhered to the walls and floors of the gallery and then scraped back to create a material memory of a space. She also constructs canvases and sculptures that replicate paintings and antiques from early American art history from canvas, Foamcore, paint and papier-mâché only to falsify their ruination by devices associated with their historical significance.